If you want to make sure that the restaurant you are running becomes successful, then you will need to devise an effective way to market it. That is why it is important for you to learn how to make a restaurant marketing plan. This article will teach you all that you need to know in order to properly make one. If you are going to come up with a marketing plan, then the first thing that you will need to consider would be the goal or goals that you will need to aim for. Think about what it is that your restaurant is trying to accomplish via an effective marketing strategy. Make sure that the goal is clear and can be actually worked towards. If you are going to market your restaurant, then it is important for you to know who you are going to market it to. Identifying your target market is very important as the marketing strategies you’ll be coming up with must cater to these people. You can figure this out by knowing who benefits the most from what your restaurant offers, who comes in often, how much they usually spend and more. If you are going to market your restaurant, then it’s only logical that there will be other restaurants that will be marketing themselves as well. It is in your best interest to conduct a competitive analysis that will tell you what strategies they’re using, how effective they are, the areas of opportunity they’re taking advantage of and so on. Now that you have an idea as to who your target audience is and the competitors that you should look out for, then next is to think of the marketing strategies you will need to implement. Think of how to best use the strengths of your restaurant to take advantage of areas of opportunities. Provide clear descriptions regarding how these strategies should be done. You won’t be able to implement any kind of strategy unless you are able to come up with a budget. Think about how much you are going to need to get the resources that will allow you to effectively market your restaurant. Be sure to come up with a list of all the things that are needed and make sure that you are able to calculate the prices as accurately as possible. At some point, you will need to update your marketing plan as you will never know when the industry might change. Always be sure to keep up with the latest trends and do what you can to help your restaurant adjust accordingly. Also, make sure that the rest of the employees are aware of these changes before you do anything. 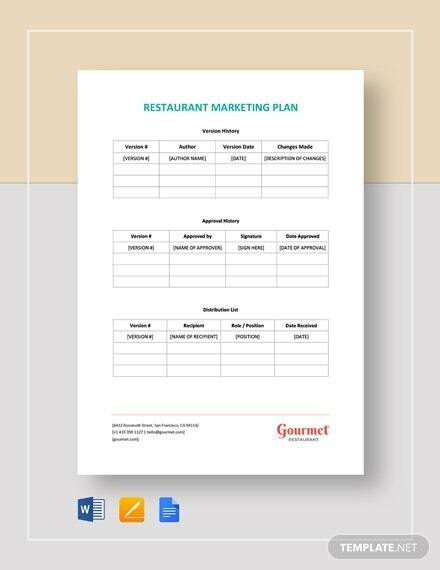 Should you wish to make a restaurant marketing plan, then know that this template is always available for you to download. Once you have it, you can use Google Docs, Microsoft Word, or Apple Pages to open and make whatever changes you want until you are satisfied with the result. When making a marketing plan, you will need to decide on the different actions that need to happen to make the plan work. 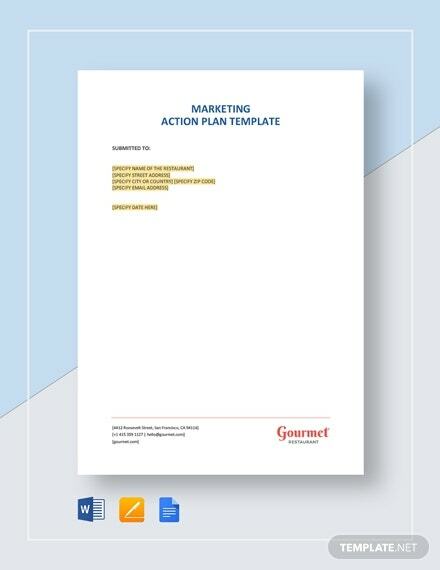 When you already know what those are, then you should consider downloading this marketing action plan template. With it, you can create a document where you can specifically point out what these actions are and how to do them. When running your own restaurant, you will need to consider how it should go about in terms of its marketing. If you have come up with a plan on how its marketing should be handled, then you’ll want to make use of this template. 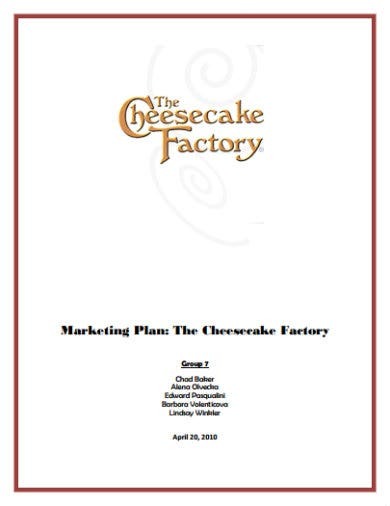 Download and use it to create a document where you can place your entire marketing plan. If you are going to market your restaurant, then you will need to think strategically in regards to what needs to happen, who to market to, what you’ll need and more. 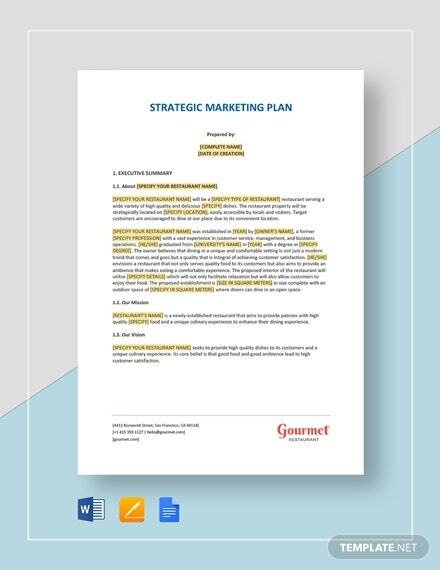 So should you decide to come up with a strategic marketing plan for your restaurant, then it’s to your benefit to download and use this template to help you. Nowadays, it’s much easier to promote one’s restaurant via online means. However, you still need to come up with a plan that will allow you to effectively do so. 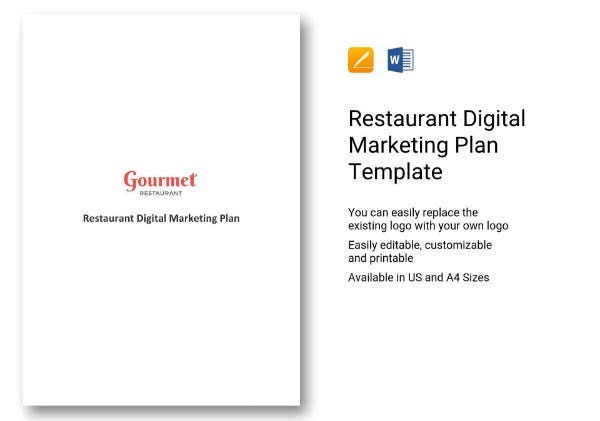 Once you’ve come up with an idea in regards to how you should digitally market your restaurant, then use this template to make the document where you can present your plan. Sometimes, it’s best to go the simple route when it comes to making any sort of plan. 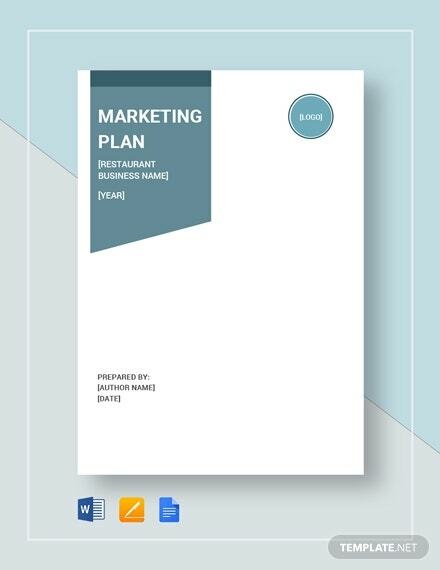 So if you want to make a restaurant marketing plan that anyone can easily understand, then you should highly consider downloading and making use of this particular template. How do I write a business plan for a restaurant?